It’s not your average science fair when the 16-year-old winner manages to solve a global waste crisis. But such was the case at last May’s Canadian Science Fair in Waterloo, Ontario, where Daniel Burd, a high school student at Waterloo Collegiate Institute, presented his research on microorganisms that can rapidly biodegrade plastic. Daniel had a thought it seems even the most esteemed PhDs hadn’t considered. Plastic, one of the most indestructible of manufactured materials, does in fact eventually decompose. It takes 1,000 years but decompose it does, which means there must be microorganisms out there to do the decomposing. Could those microorganisms be bred to do the job faster? That was Daniel’s question, and he put to the test with a very simple and clever process of immersing ground plastic in a yeast solution that encourages microbial growth, and then isolating the most productive organisms. The preliminary results were encouraging, so he kept at it, selecting out the most effective strains and interbreeding them. After several weeks of tweaking and optimizing temperatures Burd was achieved a 43 percent degradation of plastic in six weeks, an almost inconceivable accomplishment. With 500 billion plastic bags manufactured each year and a Pacific Ocean Garbage Patchthat grows more expansive by the day, a low-cost and nontoxic method for degrading plastic is the stuff of environmentalists’ dreams and, I would hazard a guess, a pretty good start-up company as well. NOTE to the comment below: Yes there are certainly methods for decomposing plastic, but most are chemical in nature not organic, requiring high temperatures and chemical additives to cause the plasticizers to vaporize, for instance this patent on PVC extraction. There have been several successful bacteria-based solutions developed at theDepartment of Biotechnology in Tottori, Japan as well as the Department of Microbiology at the National University of Ireland, but both apply only to styrene compounds. It goes without saying that these discoveries need to be tested to ensure, for instance, that the byproducts of organic decomposition are not carcinogenic (as in the case with mammalian metabolism of styrene and benzene). The processing of plastics by these methods would also have to be contained in highly controlled environments. So, no, we’re not talking about a magic panacea or a plastic-free paradise, but the innovative application of microorganisms to break down our most troublesome waste products is nevertheless a major scientific breakthrough. One of our readers pointed out a very interesting study in 2004 at the University of Wisconsin that isolated a fungus capable of biodegrading phenol-formaldehyde polymers previously thought to be non-biodegradable. Phenol polymers are produced at an annual rate of 2.2 million metric tons per year in the United States for many industrial and commercial applications including durable plastics. This story has generated a flurry of feedback since it was posted on June 12. Here’s a compilation of the best and brightest comments. The Amazon is home to more species than almost anywhere else on earth. One of them, carried home recently by a group from Yale University, appears to be quite happy eating plastic in airless landfills. The group of students, part of Yale’s annual Rainforest Expedition and Laboratory with molecular biochemistry professor Scott Strobel, ventured to the jungles of Ecuador. The mission was to allow “students to experience the scientific inquiry process in a comprehensive and creative way.” The group searched for plants, and then cultured the microorganisms within the plant tissue. As it turns out, they brought back a fungus new to science with a voracious appetite for a global waste problem: polyurethane. The common plastic is used for everything from garden hoses to shoes and truck seats. Once it gets into the trash stream, it persists for generations. Anyone alive today is assured that their old garden hoses and other polyurethane trash will still be here to greet his or her great, great grandchildren. Unless something eats it. The fungi, Pestalotiopsis microspora, is the first anyone has found to survive on a steady diet of polyurethane alone and–even more surprising–do this in an anaerobic (oxygen-free) environment that is close to the condition at the bottom of a landfill. Student Pria Anand recorded the microbe’s remarkable behavior and Jonathan Russell isolated the enzymes that allow the organism to degrade plastic as its food source. The Yale team published their findings in the journal Applied and Environmental Microbiology late last year concluding the microbe is “a promising source of biodiversity from which to screen for metabolic properties useful for bioremediation.” In the future, our trash compactors may simply be giant fields of voracious fungi. Who knows what the students in the rainforest will turn up next? I blogged about a Canadian student’s discovery of plastic-eating microorganisms last May. Just last month, another 16-year-old high school student (this time from Taiwan), Tseng I-Ching swept the world’s largest science fair in the Peoples Choice Category at the Intel International Science & Engineering Fair (ISEF) for her discovery of apolystyrene-decomposing bacterium derived from mealworm beetles. I-Ching vivisected more than 500 mealworm beetles to isolate the single bacterium that allows the mealworm to digest one of the most troublesome forms of waste on the planet — Styrofoam. For her discovery, I-Ching was awarded the top prize in the microbiology category along with four other prizes. There have been two successful bacteria-based solutions for styrene decomposition developed at the Department of Biotechnology in Tottori, Japan, as well as the Department of Microbiology at the National University of Ireland. Both rely upon a patented soil organism called Pseudomonas putida. Polystyrene is the bad boy of the petrochemical industry. In addition to the highly toxic chemicals required to manufacture polysterene products (namely benzene), expanded polystyrene foam requires ozone-depleting HCFC’s (CFC’s used to be used to make Styrofoam, but they have been banned for the most part). Then once disposed, it basically NEVER decomposes. It does however break apart into smaller granules, but because of its light weight, those particles quickly become both airborne and waterborne, where they wreck havoc on the ocean food chain. The U.S. disposes of about 25 billion Styrofoam cups every year and tons more extruded and expanded polystyrene packaging material. It’s a big, big problem. Biodegradable alternatives are now hitting the market, but hopefully Tseng I-Ching’s small discovery will help give to give existing Styrofoam waste a proper burial. “There is a large part of the central Pacific Ocean that no one ever visits and only a few ever pass through. Sailors avoid it like the plague for it lacks the wind they need to sail. Fisherman leave it alone because its lack of nutrients makes it an oceanic desert. This area includes the “horse latitudes,” where stock transporters in the age of sail got stuck, ran out of food and water and had to jettison their horses and other livestock. Surprisingly, this is the largest ocean realm on our planet, being about the size of Africa – over ten million square miles. A huge mountain of air, which has been heated at the equator, and then begins descending in a gentle clockwise rotation as it approaches the North Pole, creates this ocean realm. The circular winds produce circular ocean currents which spiral into a center where there is a slight down-welling. Scientists know this atmospheric phenomenon as the subtropical high, and the ocean current it creates as the north Pacific central or sub-tropical gyre. it is these useful properties of plastics, which make them so harmful when they end up in the environment. Plastics, like diamonds, are forever! research has documented six pounds of plastic for every pound of plankton in this area. My latest 3-month round trip research voyage just completed in Santa Barbara this week, (our departure was covered by SBNP) got closer to the center of the Garbage Patch than before and found levels of plastic fragments that were far higher for hundreds of miles. colorful plastic fragments in their bellies. look like the cigarette lighter shelf at a convenience store they contain so many of them. however. There is a darker side to pollution of the ocean by ubiquitous plastic fragments. shown to have a number of negative effects in everything from birds and fish to humans. lower sperm counts and higher ratios of females to males in both humans and animals. Unchecked, this trend is a dead end for any species. The cause célèbre of plastic litter in the ocean is the Texas-sized, swirling island of plastic debris thousands of miles off the coast of California in the Pacific Ocean. But researchers from the Universities of Washington and Delaware and the Sea Education Association in Woods Hole, Mass., say the story is much bigger, and scarier, than that. They say scientists have only skimmed the surface on the devastating pollution caused by plastic debris in the ocean, and the research community is likely underestimating the amount of plastic in the ocean. According to new research, natural ocean processes such as wind, drag, turbulence and wave height can push the plastic deep down, where it floats along, suspended underwater and unobserved by people examining the ocean’s surface. The research is published in the journal Geophysical Research Letters. Giora Proskurowski, the University of Washington researcher, said his eureka moment happened while working on a research sailboat 2,000 miles off the West Coast. Looking overboard, as the wind died down, he saw little white particles littered over the surface. “It was like a photograph coming into focus,” he said. As the rippled waves on the surface died, the white specks appeared. But half an hour later, as the wind picked it up, they all disappeared. He decided to take samples from below the surface, at a depth of 16 feet. And there, he discovered plastic moving through the water column, even though he couldn’t see it on the surface. Taking the experiment a step further, Proskurowski looked at data that had been collected by the Sea Education Association from the 1990s and early 2000s. He also collected more samples from the North Atlantic at different depths, going down as far as 100 feet. “Almost every tow we did contained plastic, regardless of the depth,” he said. Using that data with wind measurements that had been collected, Proskurowski and his team were able to devise a simple model that can potentially be used by others, including non-scientists, to match wind data with surface plastic collections to estimate how much was missed by only skimming the surface. “In order to make an accurate estimate, you need to consider the wind conditions under which that sample was taken,” he said. The team is hoping others will use this model – which is available upon request – to evaluate current investigations of plastic pollution in the ocean. “I think what this research really shows is that I can go out in the middle of the ocean – five days away from land – into one of the remotest parts of the planet, and scoop up plastic,” he said. “I think it’s a stark reminder of the impact our society has on the planet.” “And it should make us realize that any systematic cleanup approach we might make is going to be difficult,” he said. The American Chemistry Council, the chemical and plastics industry trade group, could not be reached for comment. Capt. Charles Moore of the Algalita Marine Research Foundation in Long Beach said the research supports the work his own organization has done, which also has found that plastic sinks in the water column and its presence is underestimated. “I’d suggest they start analyzing the sediments of the mouths of urban rivers,” where plastics heavier than water get mixed in with soils, Moore said. Newly discovered bacterial alchemists could help save billions of plastic bottles from landfill. The Pseudomonas strains can convert the low-grade PET plastic used in drinks bottles into a more valuable and biodegradable plastic called PHA. PHA is already used in medical applications, from artery-supporting tubes called stents to wound dressings. The plastic can be processed to have a range of physical properties. However, one of the barriers to PHA reaching wider use is the absence of a way to make it in large quantities. The new bacteria-driven process – termed upcycling – could address that, and make recycling PET bottles more economically attractive. Although billions of plastic bottles are made each year, few are ultimately recycled. Just 23.5% of US bottles were recycled in 2006. This is because the recycling process simply converts the low value PET bottles into more PET, says Kevin O’Connor at University College Dublin, Ireland. “We wanted to see if we could turn the plastic into something of higher value in an environmentally friendly way,” he says. O’Connor and colleagues knew that heating PET in the absence of oxygen – a process called pyrolysis – breaks it down into terephthalic acid (TA) and a small amount of oil and gas. They also knew that some bacteria can grow and thrive on TA, and that other bacteria produce a high-value plastic PHA when stressed. So they wondered whether any bacteria could both feed on TA and convert it into PHA. Getting ordinary plastic bags to rot away like banana peels would be an environmental dream come true. After all, we produce 500 billion a year worldwide and they take up to 1,000 years to decompose. They take up space in landfills, litter our streets and parks, pollute the oceans and kill the animals that eat them. Now a Waterloo teenager has found a way to make plastic bags degrade faster — in three months, he figures. Daniel Burd’s project won the top prize at the Canada-Wide Science Fair in Ottawa. He came back with a long list of awards, including a $10,000 prize, a $20,000 scholarship, and recognition that he has found a practical way to help the environment. Daniel, a 16-year-old Grade 11 student at Waterloo Collegiate Institute, got the idea for his project from everyday life. “Almost every week I have to do chores and when I open the closet door, I have this avalanche of plastic bags falling on top of me,” he said. “One day, I got tired of it and I wanted to know what other people are doing with these plastic bags.” The answer: not much. So he decided to do something himself. He knew plastic does eventually degrade, and figured microorganisms must be behind it. His goal was to isolate the microorganisms that can break down plastic — not an easy task because they don’t exist in high numbers in nature. First, he ground plastic bags into a powder. Next, he used ordinary household chemicals, yeast and tap water to create a solution that would encourage microbe growth. To that, he added the plastic powder and dirt. Then the solution sat in a shaker at 30 degrees. After three months of upping the concentration of plastic-eating microbes, Burd filtered out the remaining plastic powder and put his bacterial culture into three flasks with strips of plastic cut from grocery bags. As a control, he also added plastic to flasks containing boiled and therefore dead bacterial culture. Six weeks later, he weighed the strips of plastic. The control strips were the same. But the ones that had been in the live bacterial culture weighed an average of 17 per cent less. That wasn’t good enough for Burd. To identify the bacteria in his culture, he let them grow on agar plates and found he had four types of microbes. He tested those on more plastic strips and found only the second was capable of significant plastic degradation. Next, Burd tried mixing his most effective strain with the others. He found strains one and two together produced a 32 per cent weight loss in his plastic strips. His theory is strain one helps strain two reproduce. Tests to identify the strains found strain two was Sphingomonas bacteria and the helper was Pseudomonas. A researcher in Ireland has found Pseudomonas is capable of degrading polystyrene, but as far as Burd and his teacher Mark Menhennet know — and they’ve looked — Burd’s research on polyethelene plastic bags is a first. Next, Burd tested his strains’ effectiveness at different temperatures, concentrations and with the addition of sodium acetate as a ready source of carbon to help bacteria grow. At 37 degrees and optimal bacterial concentration, with a bit of sodium acetate thrown in, Burd achieved 43 per cent degradation within six weeks. Burd would like to take his project further and see it be used. He plans to study science at university, but in the meantime he’s busy with things such as student council, sports and music. “Dan is definitely a talented student all around and is poised to be a leading scientist in our community,” said Menhennet, who led the school’s science fair team but says he only helped Burd with paperwork. “Bacteria could help transform a key component of disposable cups, plates and utensils into a useful eco-friendly plastic, significantly reducing the environmental impact of this ubiquitous, but difficult-to- recycle waste stream, according to a study scheduled to appear in the April 1 issue of the American Chemical Society journal, Environmental Science & Technology. The microbes, a special strain of the soil bacterium Pseudomonas putida, converted polystyrene foam — commonly known as Styrofoam™ — into a biodegradable plastic, according to Kevin O’Connor, Ph.D., of University College Dublin, the study’s corresponding author. The study is among the first to investigate the possibility of converting a petroleum-based plastic waste into a reusable biodegradable form. O’Connor and his colleagues from Ireland and Germany, utilized pyrolysis, a process that transforms materials by heating them in the absence of oxygen, to convert polystyrene — the key component of many disposable products — into styrene oil. The researchers then supplied this oil to P. putida, a bacterium that can feed on styrene, which converted the oil into a biodegradable plastic known as PHA (polyhydroxyalkanoates). The process might also be used to convert other types of discarded plastics into PHA, according to O’Connor. One might rethink playing with snow or walking in the rain as a new study by scientists from the Louisiana State University revealed that snow and rain might form mostly on bacteria in the clouds. Scientists have long known that the ice crystals in clouds, which become rain or snow, need to cling to some kind of particle, called ice nucleators, in order to form in temperatures above minus 40 degrees Celsius. Microbiologist Brent Christner at Louisiana State University sampled snow from Antarctica, France, and the Yukon and found that as much as 85 percent of the nuclei were bacteria, he said in a telephone interview with the Associated Press. “Every snow and ice sample we’ve looked at, we found biological ice nucleators. Here’s a component that has been completely ignored to date,” Christner said. The most common bacteria found was Psedomonas syringae, which can cause disease in several types of plants (tomatoes, green beams and other similar plants). The bacterium was found in 20 samples of snow from around the world and subsequent research has also found it in summer rainfall in Louisiana. Scientists have sought ways to eliminate this bacterium in time. Now they wonder whether this elimination would result in less rain or snow, or would soot and dust be the major generators of precipitation. “The question is, are they a good guy or a bad guy. And I don’t have the answer to that,” Christner said, quoted by the same source. One thing is for sure. Bacteria that infect plants may multiply on the plants’ leaves and drift into the atmosphere. These bacteria could then cause precipitation and land on another plant, where the life cycle could continue, Christner said. Los Alamos’ Omega West is a swimming-pool-type research reactor whose fuel rods are suspended under 25 ft. of water, which acts not only as coolant and moderator but also shields its human operators from radioactivity. In the spring of 1958, physicists peering down through it saw that the water was getting cloudy. They called Chemist-Bacteriologist Eric B. Fowler of the laboratory’s radioactive-waste disposal group, who found that it was swarming with microorganisms, about i billion per quart. The bugs turned out to be rod-shaped bacteria of the genus Pseudomonas, which were feeding on resin and felt in the water purifying system. The fierce radiation in the reactor appeared to bother the bacteria hardly at all. When the reactor was shut down but still highly radioactive, they multiplied fast. Even when it was running full blast, they held their own. Since they normally divide every 20 minutes or so, this meant that radiation was killing only about as many as managed to live and divide. Just how much radiation the Pseudomonas got is hard to estimate, because the water circulates at varying distances from the core of the reactor, but Dr. Fowler thinks they may have absorbed more than 10 million rep (roentgen equivalent physical) in an eight-hour day, which is 10,000 times the dose that is fatal to man. Many other microorganisms must have got into Omega West’s deadly water; only the Pseudomonas survived. Perhaps the Pseudomonas have natural resistance to radiation. More likely, under the bombardment of Omega’s radiation, normal Pseudomonas underwent mutation, producing a special strain capable of surviving in this atomic blast. This ability to transform themselves quickly to cope with new conditions is a specialty of humble bacteria, whose constitutions are relatively simple. It is an ability that higher animals cannot emulate, but may have reason to envy. hypertrophy to a manageable size. confer their horizontal spread to other clones and species. with unrestricted gene flow in the population. the genome that can be exploited for the typing of P. putida strains. of these tools and methods have been developed for and applied in P.
impact on production of virulence factors of this organism. 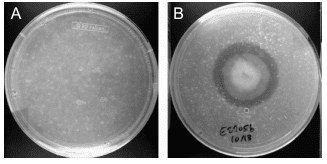 Pseudomonas aeruginosa is a highly relevant opportunistic pathogen. mutations and/or horizontal transfer of antibiotic resistance genes. P. aeruginosa populations to antibiotics treatment. secretion of siderophores which complex iron (III) with high affinity. have been identified and the functions of the encoded proteins known. heme reflecting their great adaptability to diverse iron sources. diffusible signal molecule-mediated quorum sensing in P. aeruginosa. This entry was posted in interspecies, spectre, tech and tagged citizenship, climate, greentech, nature, research, sci-fi by secret santa. Bookmark the permalink.